Carnegie Magic and The Steampunk Illusionist: What Came Before The Rabbit and Hat? What Came Before The Rabbit and Hat? John Henry Anderson was a Victorian Era Magician who is credited with the being the first magician to produce a Rabbit from a Top Hat. Since then, the Rabbit/Hat image has become associated with magicians world-wide (and some of us are sick of it). Anyway, before magicians started producing rabbits, there was another creature that was popular among magicians, the Goldfish. effect called The Fountain of Love. It begins with a glass goblet containing some sort of murky brown water apparently from the 'Fountain of Love'. A borrowed ring is tossed into the water to test whether the volunteer who lent the ring has true love, for if he/she does, the water will turn crystal clear. The performer covers the glass goblet with a scarf for a moment and then when it is removed the water can be seen to be clear and there are a a couple goldfish swimming inside the goblet. But the even more amazing part, one of the fish apparently has the ring in it's mouth! A net is used to retrieve the fish and the ring. In Paris France, Robert-Houdin, known as the Father of Modern Magic, was producing fishbowls full of fish. In England, Chung Ling Soo presented an illusion called Aerial Fishing where he would use a fishing pole to magically catch fish from mid-air. He also presented an effect where he would produce a huge bowl of water on the stage. 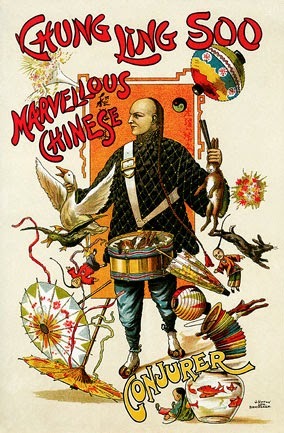 I think, that his predecessor Ching Ling Foo was the first to do this, and then every Asian inspired magic act seemed to include a version of it. The effect is captured in the movie The Prestige, though in that movie they produce, what else, a large bowl of goldfish. I read that Richiardi had a goldfish production in his show for a time. He had several buckets of water that he poured into an empty aquarium. He covered the tank momentarily and then removed the cover to display a tank filled with fish. Doug Henning produced two fish in a barehanded presentation on one of his TV shows in the 1970s and David Copperfield, also using a barehanded method, produced what looked like 50 goldfish on a TV special a few years ago. Probably my favorite of all the goldfish productions is presented by Luis DeMatos of Portugal. He starts with a single fish production followed by producing an entire aquarium full of fish. He currently uses this effect in The Illusionists 2.0 touring show. And no article about Goldfish magic would be complete without mentioning Mac King. Mac is a comedy magician who does a hilarious version of Aerial Fishing with a spectator from the audience. I have presented so many different goldfish productions that some of my friends jokingly call me 'The Goldfish Magician'. My current favorite version would probably be looked upon quite fondly by my Victorian predecessors...I draw a picture of a fishbowl and fish and then produce the fish from the picture. But I'm currently working on a new Steampunk Fish Production which should be interesting, especially if it ends up working, lol! I'll post images once it's completed.